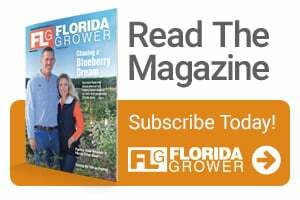 UF/IFAS researchers say they have developed genetically modified citrus trees that show enhanced resistance to greening, and have the potential to resist canker and black spot, too. A set of transgenic citrus trees with the Arabidopsis thaliana NPR1 gene construct on trial in South Florida. Jude Grosser, a professor of plant cell genetics at the UF/IFAS Citrus Research and Education Center in Lake Alfred, and Manjul Dutt, a research assistant scientist, used a gene isolated from Arabidopsis thaliana, a member of the mustard family, to create the new trees. Their experiment resulted in trees that exhibited enhanced resistance to greening, reduced disease severity, and even several trees that remained disease-free after 36 months of planting in a field with a high number of diseased trees. Grosser and Dutt’s research team used sweet orange cultivars Hamlin and Valencia and created plants that defend themselves against pathogens utilizing a process called systemic acquired resistance (SAR). SAR provides protection against a broad spectrum of microorganisms and is associated with the production of anti-pathogen proteins. 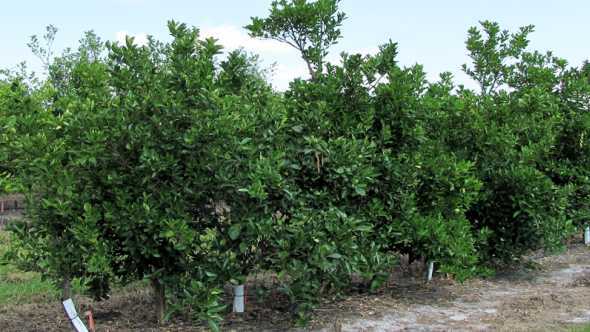 First, in a greenhouse study conducted with Southern Gardens Citrus in Clewiston, several hundred trees (clones from several independent transgenic plant lines) were exposed continuously for two years to free-flying, greening-positive psyllids. Trees were routinely pruned and fertilized to stimulate new leaf production. These trees were evaluated every six months for two years for the presence of greening. The insects were also randomly evaluated during this study for the presence of the greening bacterium. Approximately 45% of the trees expressing the Arabidopsis gene tested negative for greening. In three of the transgenic lines, the greening bacterium was not detected at all. Control trees tested positive for the presence of greening within six months and remained positive for the entire duration of the study. In the second concurrent study, selected transgenic trees and controls were cloned, grown, and planted in fields with a 90% percent HLB infection rate. These trees were similarly evaluated every six months for three years for the presence of the greening bacterium. In this study, one transgenic line remained greening-free for the duration of the study, except for the 24-month sampling period when it tested positive. A second line tested positive at the 30-month sampling period while a third line tested positive at 30 months, but was greening-free at 36 months. Neither of these lines declined in health, and both showed continued growth with periodic flushes. The next steps include transferring this gene into additional commercial varieties and rootstocks that are commonly grown in Florida. Do you think a GMO citrus tree will be the ultimate solution for HLB? In addition, researchers must stack this gene with another transgene that provides resistance to the greening bacterium by a completely different mechanism. That will prevent the pathogen from overcoming the resistance in the field. According to researchers, it will still be several years before such trees will be available for commercial use. For more details on Grosser and Dutt’s study, check out the recently published paper from PLOS ONE. Lets get it going! Why wait? The Bible talks about faith in a mustard seed! David, you’re kidding, right? If so, hilarious!